Lansing State Journal columnist Graham Couch and Detroit Free Press / LSJ MSU beat writer Chris Solari break down the Spartans’ tough day in West Lafayette. EAST LANSING — Michigan State guard Eron Harris’ college career is over. The senior from Indianapolis will undergo surgery on his right knee after injuring it during Saturday’s 80-63 defeat at No. 16 Purdue, another major loss as Tom Izzo’s team tries to balance a small and young lineup while pushing for an NCAA tournament berth. Harris drove to the basket with 9:18 to play in the second half, contorted his body for a lay-up and landed awkwardly under the hoop. 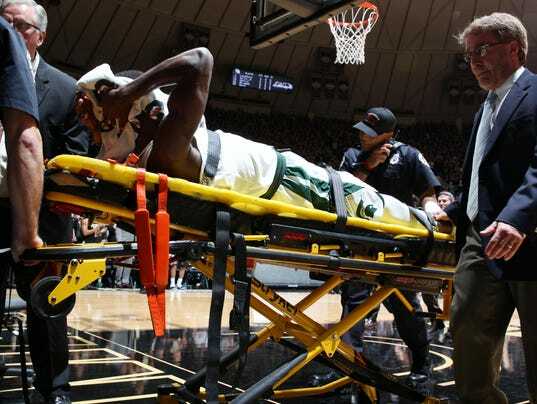 He had to be wheeled off the court on a stretcher to a standing ovation from the Purdue fans. A number of Harris’ teammates were crying. Harris responded to his supporters who have poured in with well-wishes on Sunday night on Twitter. It’s the third season-ending knee injury for an MSU senior this season. Gavin Schilling and Ben Carter, both 6-foot-9 forwards, were lost during preseason workouts, which is part of the reason coach Tom Izzo is struggling to juggle his post players.